This page lists all reports that for Norway only that do not involve other countries. Click here for a list of all reports involving Norway. Part 3: From Trondheim to Larvik. National Cycle Route 9 and the NSCR. Excerpt from Day 25: Græsli to Røroswildlife. We noticed some curious things about reindeer. Firstly although there was nothing to stop the reindeer from walking off the road and onto the tundra it chose to stay on the road. As it moved along the road its legs looked like (Damae's term) egg beaters all flailing in different directions. It looked like an unfeasibly ungainly animal that was testing the limits of Darwin's theory. However, even more suprisingly, once it finally found its way to the rough undulating tundra it moved with astonishing ease and grace. The head and body just seemed to glide across the landscape on top of those big hooves. National Cycle Route 9 was an unknown quantity for us in 2008. There were no travelogues to be found of the whole route, nor any guide books. Armed with some home made maps we set off, boldly, from Trondheim. It was another route of contrasts, from the majestic to the banal with some surprises along the way, including a long ferry down Lake Femund. The travelogue contains the story of each day's cycle with pictures and videos, a gallery, route and map information and trip statistics. All was quiet when we awoke. There was no sign of the Polish tradesmen nor their vans and we hadn't heard them leave. The sun was shining and the tent covered in dew. It was going to be another lovely day. 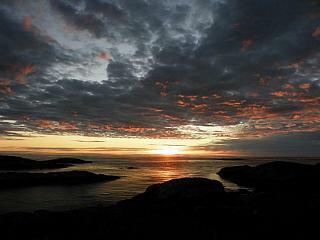 It was also just a little exciting to be back to the coast of Norway and a part of it we'd not been to yet. We realised too that now we were following the coast our rate of progress would be determined not just by how much energy we had. For instead of following river valleys we were now cutting across the ends of fjords and hopping from island to peninsula and back which meant we would be at the mercy of ferry timetables. The coast route, part of which forms the NSCR in Southern Norway, carries on past Bergen. We chose to follow it up to Trondheim and were treated each day to beautiful scenery, skies and some special places. Not to mention some challenging cycling. Excerpt from Day 5: Haukeli to Røldal - going over Vågslid tunnel. Looking at the old road we briefly entertained the idea of staying on the main road and cycling through the tunnel. The old road in contrast climbed sharply so it was tempting to take the main road. However we were following the route 3 so it was now time for a real challenge. After packing in and gathering our energies that is exactly what we got. The further we climbed the more our muscles protested, our heart rates soared and the sound of the main road waned until it was no longer to be heard. It was the challenge of being a cyclist once more, alone in a landscape just you and the hill: the sound of your breath, the wind and the noise of the bike underneath you. National Cycle Route 3 is a challenging and rewarding route, with several major climbs and varied landscape. We followed it to Førde where we headed out to Florø on the coast to start part two of the trip. The travelogue contains the story of each day's cycle with pictures, a gallery, route and map information and trip statistics. We enjoyed our first tour of Norway in the fjords, so two years later we went back to see more. For many bicycle tourists Nordkapp, the northernmost road in Europe, is the final destination but because we had limited time we decided to start from Nordkapp and head south. 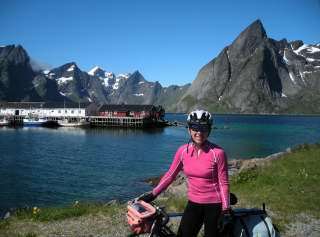 We cycled through Lofoten, along the Coast Route, then through the fjords to finish at Skjernøy, close to the southernmost point of Norway. If you have two weeks to spare and a young children, the Lofoten and Vesteralen islands are an ideal area for a summer tour - gorgeous scenery, warm weather, white sandy beaches, and 24 hour sunshine. Best of all, the roads are free from traffic and pretty flat in this area since they hug the seashore. Self-catering accomodation in rorbus (fishing huts) is affordable and very memorable. This is the story of our madcap journey above the Arctic Circle in 2005 with two touring bikes and trailer bike, complete with a guide to accomodation on the islands, some tips about places to visit, and a brief list of what to take with you and what to leave behind. The area described is quite popular with touring cyclists but nowhere near as busy as other destinations during the summer holidays, so people are friendlier and there's far more space to relax in - like New Zealand, but only a couple of hours from the UK by air. La tappa prevista [Lillehammer - Gjovik] è talmente breve che ce la prendiamo con comodo e tentiamo di visitare Lillehammer, che però non offre un granchè. Così partiamo lungo il percorso che ci indica la nostra cartina, prima lungo la principale e poi lungo stradine secondarie che saliscendono nel bosco, dove ci fermiamo a raccogliere mirtilli. I miei loschi intenti di papparceli a pranzo affogati nel gelato sono bloccati dall'Anto che propone di portarli alla famiglia Servas che ci ospiterà alla sera. A malincuore accetto. Dopo pranzo ci permettiamo addirittura un pisolino a Moelv, dove un ponte ci conduce sull'altra sponda (est) del lago, che seguiamo docilmente fino a Gjovik. Qui la nostra ospitante si rivela una simpaticissima persona, con cui si instaura immediatamente un gran feeling, che rischia di sfociare in amore aperto quando concludiamo la cena con i nostri mirtilli più le sue fragole e una vascona di gelato alla vaniglia. Dopo cena, benchè quasi tramortito dalle tre o quattro porzioni di gelato, riesco a seguire l'Anto, la signora e la figlia in un giro turistico della cittadina, che le nostre due amiche coronano con un bagno in piena digestione in un laghetto artificiale freddino nell'aria fresca della sera. Ma sopravvivono, anzi, sono proprio contente. Réveil paisible avec le chant des oiseaux, avant d´aborder 2 cols successifs. Pas le temps de chauffer la ``bête'', ca monte dès le premier virage. Après 2 km, je rejoins les italiens qui ont campé dans le jardin d´une maison du village précédent. Au sommet du col (275m), je décide de continuer à mon rythme qui est légèrement plus rapide que le leur. Passé Hauge, je poursuis par la route de Rekefjord. Elle est splendide mais très sinueuse, le dernier troncon avant de rejoindre la route 44 n´est même pas asphalté. Je reprends des forces sur la place centrale d´Egersund en terminant mon saucisson emmené de Suisse. Egersund est une ville principalement active autour de son port. Après cette partie montagneuse, je pensais pouvoir continuer tranquillement en longeant la mer du Nord. C´est un peu plus plat, mais un vent violent de face me rend la progression difficile... je ne vois pas le bout de ces longues lignes droites qui n´en finissent plus. Enfin la voilà cette AJ de Vigrestad, que j´ai cherchée durant une demi heure, qui se trouve en fait dans le hameau voisin de Härr. Seule une famille danoise y loge avant d´aller reprendre le ferry à Kristiansand. Je m´y cuisine un excellent riz casimir au Gruyère pour me remettre d´aplomb. Je suis fatigué après cette journée résumant bien le monde de la petite reine en Norvège : ca monte et ca descend tout le temps et quand c´est plat y a du vent latéral ou de face. I had been impressed by the magnificent scenery of northern Norway when, during an inter-railing trip 3 years ago, we had taken the train to Narvik, far beyond the Arctic circle, and then the bus on a long and winding journey down the coast to Bod?. I think it was at that time that I first became aware of the Lofoten Islands - as I researched the places we were to visit in Norway, I could not help but notice references to these magnificent islands, which we were not to visit! Four weeks, 2500km, 30000m gain... a great ride in a great bicycle touring country. Mir scheint, es wird jede Nacht ein paar Grad kälter! Wir sind beim Erwachen fast am Boden festgefroren. Das liegt sicher auch daran, daß wir uns schon nahe 1000 m Höhe befinden. Ich stehe auf und mache den obligatorischen Fotogang des Morgens. Ich sehe in der Ferne schon die Bäuerin wirken. Ich beschließe wegen der Milch zu ihr zu gehen. Sie sitzt vor dem Kuhstall und trinkt in der Sonne sitzend einen Kaffee. Ich geselle mich dazu und sie lässt mich einen Becher ``füll mil'', noch euterwarm, testen. Wir reden über Land und Leut. After two successive summers spent cycling around the Alps and then the Pyrénées. I wanted to try somewhere different. I'd wanted to visit Norway for some time [...] As usual maps were studied, this process was more in-depth than normal since I had never been to Norway and didn't know where were the best places to visit. After much research and assessing the feasibility of several options, I decided to concentrate on the southern half of the country. This provided the opportunity to cycle over the high mountain plateau of the Hardangervidda, Norway's highest peaks in the Jotunheim and to navigate my way around Norway's most famous features - its coastal fjords. Dyranut - Trondsbu - Sandhaug - Lågaros. This is the English version of the original Norwegian one: Med sykkel som bagasjetralle / Hardangervidda - fra nord til sør / Dyranut - Trondsbu - Sandhaug - Lågaros. 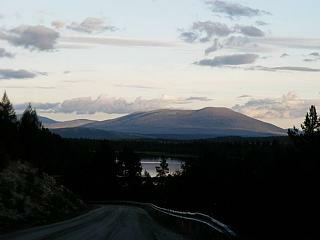 [The] report of a [...] bike trip in 1989, across the central part of the big mountain plateau Hardangervidda in Norway. The first 12 km on a narrow gravel road, the next 52 km without roads at all. My friend and I followed hiking trails. You will find the area in your world atlas when searching south of the railway line Oslo - Bergen. 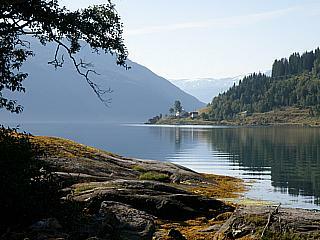 We went by train to Geilo, and bus about 40 km to a desolate point at the highway to the Hardanger fjords. The endpoint of the trip was at Mogen north of the small town Rjukan, in the Telemark county. We went by boat across the 35 km distance of Mosvatn lake. Finally we made a bike trip (25 km) at the old and forgotten construction road down to Rjukan.